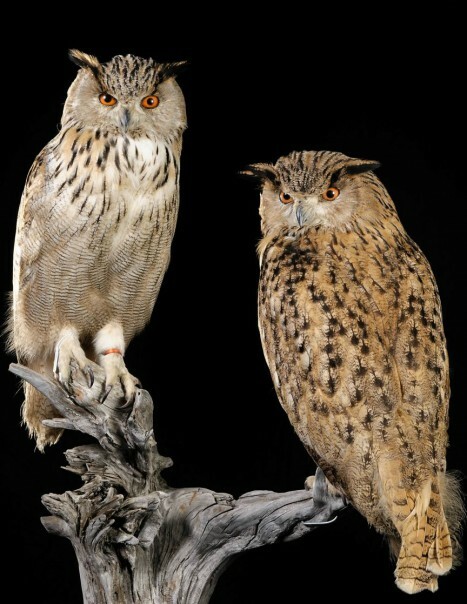 With 75 cm high, the Grand Duke is the largest of the owls of Europe: it is twice its congener-eared owl. Its silhouette is massive, its head bitten two large orange-red eyes topped by feathers of 8 cm, the bird rises vertically if excited or disturbed, and do not play any role in hearing . Its plumage is reddish-brown above, spotted and striped black. The underside is lighter, fawn with longitudinal ridges and transverse stripes of dark brown color. It weighs about 2.5 kg for the male, 3.3 kg for the female, its length is about 75 cm. Its durability is estimated at over more than 20 years in the wild and some more than 28 years in captivity. It is easily recognizable by its large scale, leaning on its great long, broad wings detaching well enough pointed head, short tail. 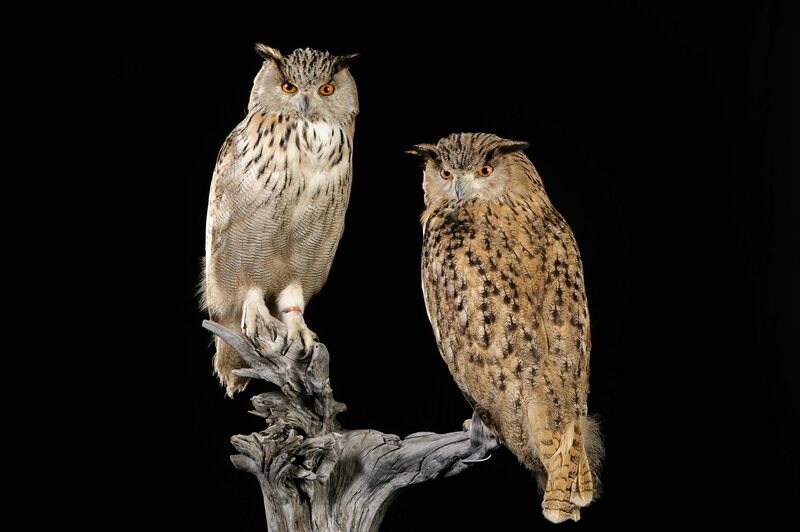 Its food is more varied: rodents, rabbits, hares, hedgehogs, birds, crows, pigeons, partridges, seabirds, bats and even other raptors and owls. It does not hesitate to go after dark hundred leagues. Its Habitat has spread throughout Europe, on rocky ledges in the plains, in the mountains. It particularly likes the cliffs near bodies of water, it is very discreet. Breeding begins in late March, early April. It builds a nest lined with fur or feathers remnants torn from its prey. The female lays 2 to 4 eggs, which she incubates alone for 32 to 37 days, the male brings its food. Once hatched, the young are protected by the mother and a month and a half later the young leave the nest but remain nearby. At three months, they know perfectly fly. In Europe, it has a great ecological and agronomic utility and it is to this day protected by law.